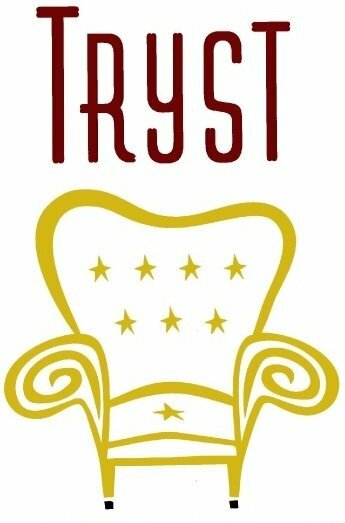 I spent a good chunk of my day yesterday curled up in a squishy, brocade armchair at Tryst, my neighborhood hipster watering hole. In honor of my lazy Sunday reading the City Paper and downing some figi green iced tea, I wanted to post about an experience I had at Tryst back in February. Since November I had been in a nearly constant state of indigestion, and knowing my proclivity for food-related discomfort, I was ready to take my allergist’s advice, and attempt an elimination diet. Undertaking such a dietary regimen would allow me to isolate foods that were problematic for me. I based my elimination diet on this model, cutting out all wheat, dairy, and meat (except chicken), and a whole host of fruits and vegetables, including corn. As you can imagine, eating became an extreme sport for me. I tried delicious new dishes (kale salads, coconut-date balls) at home, but dining out was almost impossible. During this time, I took a friend out to eat on her visit to DC. After making our rounds of the Mass Ave embassies, we wandered up to Adams Morgan for a bite at Tryst, the sister cafe to Open City. It happened to be Superbowl Sunday, and we were hoping to avoid the hype by hiding out in an uber-hipster café with Victorian couches and low, beat-up coffee tables. We were, thus, shocked to find that the one lone TV in the restaurant was actually playing the Superbowl. I had never even noticed they had a TV! Tryst is actually a wonderful place to visit during an elimination diet because they have a special “build-your-own-salad” menu. Having been resigned to decidedly monotonous salads for the past 3 weeks, I was hopeful that the various toppings offered may add up to a more interesting dish than usual. In particular, I was interested in the chicken salad, but my server was unsure of whether it contained any ingredients excluded by the elimination diet. However, just as I was about to say, “Ok, I guess I’ll have the carrots,” she says, “let me go look it up,” and whisks away to grab the ultimate restaurant tool: The Ingredient Book. I’ve come across this kind of resource rarely, but I assume that many restaurants have such a tool, whether or not they choose to share it with their customers. To my delight, the Tryst ingredient book had literally every ingredient, spice and herb that had gone into the dish, allowing me to make a completely informed and confident choice in what to order (chicken salad was a no-go, but the tuna salad was completely kosher..I mean—safe). I wonder about the feasibility of this kind of tool for all restaurants. In general, I would assume that chefs who offer a relatively static menu might easily prepare such a document for general use, but may be hesitant to share their entire ingredient list with the world. In addition, a restaurant with an oft-changing menu may find the maintenance of such a document an unnecessary burden. From my standpoint, though…it was awesome–a fantastic resource for someone with any kind of dietary restriction. Is an Ingredient Book a good idea for all restaurants? Would you feel safer about your food choices if you could study such a document? Have you ever tried an elimination diet to illuminate personal food issues?